Heart face shapes need to add some length to their shape and to create width around narrow chins. A heart face shape requires haircuts, styles and makeup that will help to flatter and minimize the width through the forehead and bring balance to the narrow jawline and chin. Your face is longer than it is wide and has a wide width. Your forehead and jawline are a similar width in appearance. Your chin is noticeably pointed. Your cheek line and the sides of your face taper into your jawline. Your forehead is wide and round at your hairline. Your face is widest at your forehead but your cheekbones are also wide and pronounced. All of these characteristics add up to face shape that is small and sweet and can be flattered with the right hairstyle and makeup choices. Any textured chin-length hairstyles will suit best. If bangs are wanted make sure that they are side-swept bangs not straight across as blunt cut bangs will only make your face shape shorter and wider. Shoulder length cuts with wispy layers that kick out will also work very well. Height on top will work but only if they belong to shoulder length or longer hairstyles. Short, full hairstyles like slicked back looks that emphasize your upper face. 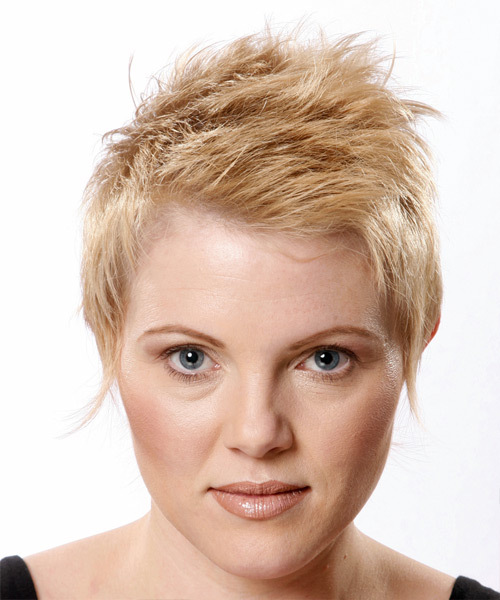 Short styles with heavy straight across bangs that create an upside down triangular shape. This is a great short hairstyle that really suits heart face shapes. 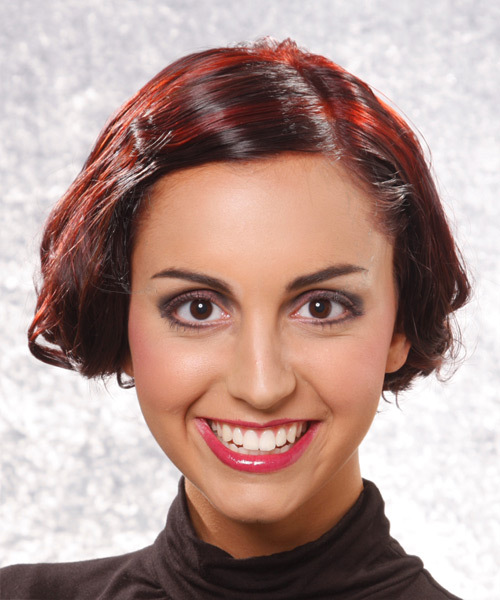 The height achieved on top adds needed length that balances out what is known as a short and mostly wide face shape. The absence of bangs also gives the illusion of more face and more height. It's simple but it is what is needed. Definitely the wrong hairstyle for heart face shapes. This cut positions hair where it just isn't needed. The heavy bangs make our models face appear shorter and wider than it already is. Next, the long wispy sides promote width, which is once again the opposite of what heart face shapes require for balance. This shape in any texture will not work and therefore must be avoided. This beauty has everything that's needed to make it the perfect hairstyle for a heart face shape. The top area has long heavy bangs swept to the side that shows off the forehead. This creates needed vertical length. The sides and back are layered and then kicked out through styling to compensate for the narrow chin that are customary with heart faces. A similar shape in other textures will work just as well. This look is too square and horizontally short to suit heart face shapes. The solid across bangs only exaggerate the box like shape that makes up this hairstyle. The bangs need removing and the sides layering for any suitability. This is a good example of what not to try if you have a heart face shape. 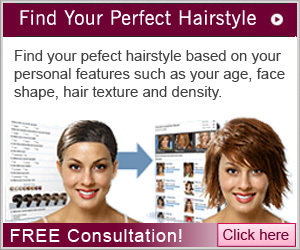 This soft forward falling hairstyle has all of the right attributes for heart face shapes. The middle part helps divide the face into two long shapes which creates the illusion of vertical length. The layers through the sides frame the chin area and below, adding hair where it's needed. 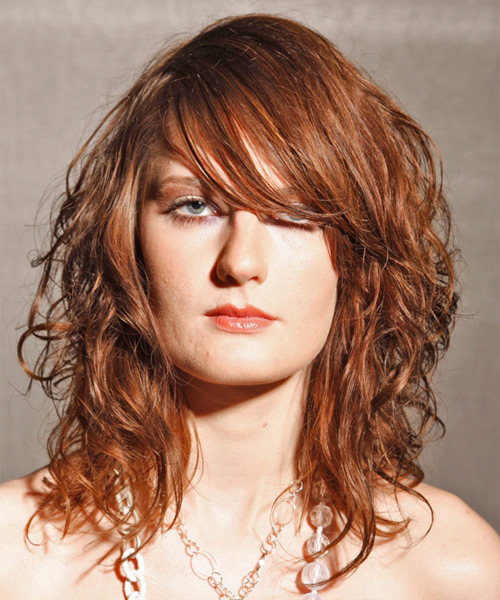 Waves and curls in the same shape will work very well and actually appear softer. This wavy look shows what not to try if you have a heart face shape. Firstly, the heavy bangs shorten the length of the face making it look wider than it already is. Secondly, the width achieved through the layers and waves once again adds width to the entire look. The result is a short, wide, fat, squashed look. Now you know what to avoid! One of the most flattering and versatile hairstyles is the bob. It comes in all different lengths, can be worn curly, straight or wavy and there is one to suit just about everyone - all you need to know is how to choose the right one for you! A short length, chin length or shoulder length (with wispy layers). Layers that provide fullness around the narrow chin. A bob that's chin length is a great length to counter balance the shortness of a heart face shape. A bob with lots of hair texture, thanks to curls, waves and the right styling products, will add fullness to help keep the width of a heart face shape in check. A slicked down top section. A bob with blunt cut bangs that cover up a large portion of your face and leave all the attention to your narrow chin should be avoided. A slicked down bob will only put emphasis on the wider, upper part of your face shape. Adding bangs to your hairstyle is a great way to create a new look without sacrificing the length of your hair or using hair color. But as with a new haircut or hair color, if you choose the wrong type of bangs, you could end up with a new look that isn't exactly the right look for you. To avoid getting bangs you'll regret, do your research first and choose the right bangs by looking at the ultimate deciding factor – your face shape. Heart face shapes require bangs that will slim down (not hide) the forehead and pull all the attention to the lower part of the face to achieve a flattering look. Long bangs that hug the frame of your face, such as the bangs pictured here, are ideal. The height through the top section of the bangs is also a plus for heart faces as it adds the illusion of length to the face shape. Long, side-swept bangs that still show off the forehead will provide much needed length to the face. Bangs that cover up the top half of your face will shorten what is already a petite face shape. Full, heavy bangs that essentially block out your entire forehead will instantly shorten your face shape and should be avoided. Although side-swept bangs should be selected over solid bangs, full, side-swept bangs that are short and cover up the majority of your forehead will not do your face shape any favors. By knowing which bangs to try and which ones to avoid, you can reap the rewards that bangs can offer to your face shape, hairstyle and look. Apply some gold eye shadow over your entire lid and a smoky blue color from the inner corner of your eye up to your brow and from under your eye to outer corner of your brow. Under the center of the brow, add some highlight and a line of blue-grey kohl underneath the lower lashes. This will all focus attention on the center of your face, reducing width. Use some blusher a shade darker than your foundation on your cheekbones and then blend it out to your hairline to help pull in your cheeks. Use a warm toned pale lipstick on your mouth to round out your chin and create width through the lower part of your face. For tips on shaping your lips, see our beauty article, Makeup Tricks: Shaping Your Lips. 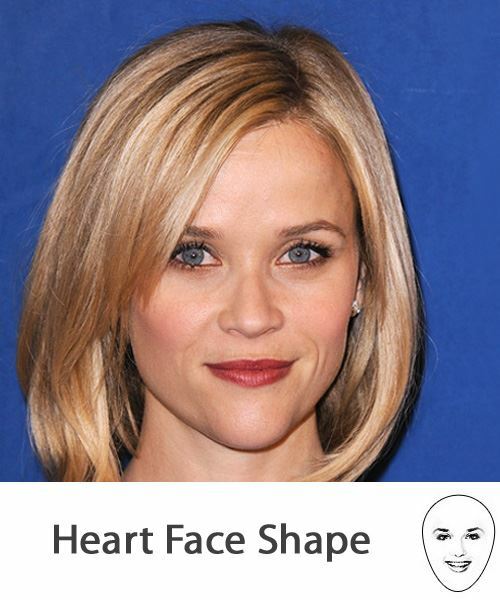 Now that you know your face shape and how to choose the right hairstyle, why not take a look through TheHairStyler.com's range of hairstyles for heart face shapes?